Andy Harrow looks back at Scotland’s Six Nations defeat to Ireland at Murrayfield. There was a lot to commend about Scotland’s performance at Murrayfield against the reigning Six Nations champions. They attacked with verve and vigour in the first half and managed to keep the visitors’ dangerous backs at bay for large periods. But they were stymied by mistakes in key areas of the field. After a promising start, Scotland went behind when Tommy Seymour collected a kick deep inside his own half and, instead of holding on and waiting for support, overthrew to an advancing Sean Maitland. Conor Murray took advantage to pick up and dive over the line. In an offensive sense, Scotland regularly worked themselves into good attacking positions, only to throw forwards, or knock on, or give away a penalty. They continually let the Irish off the hook when they could have had them pinned to the wall, wriggling and helpless. In the second half, missed tackles in the midfield led to Keith Earls’ score which ultimately sealed the win. With Scotland tiring, it effectively ended the tie as Ireland eased it out. Ireland were there for the taking, but the Scots couldn’t take advantage. 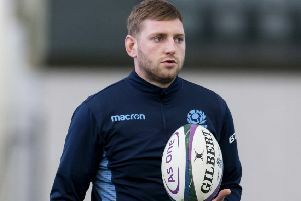 It remains to be seen how bad Stuart Hogg’s injury is, but any spell on the sidelines could badly hamper the rest of Scotland’s Six Nations campaign. Peter O’Mahony’s challenge on Hogg early in the match appeared to be an illegal one - his shoulder seemed to make deliberate contact with the onrushing Scot - but no penalty was awarded and as play continued, it eventually led to Ireland’s opener. Hogg, meanwhile, was left nursing first his head and then his shoulder, before coming off. Last weekend’s hat-trick hero, Blair Kinghorn, came on to replace Hogg and impressed with a few dramatic bursts through the Irish line in the first half, but in a game of narrow margins the home side missed their talisman’s nous and experience. Time will tell whether they’ll have him back for the remaining fixtures. With Ireland in control of the game half an hour in, Finn Russell broke through the visitors ranks and made for the try line. He would have got there if not for Keith Earls, who steamed towards him like a green-and-white Exocet. He brought Russell down short of the line and might of stopped a Scotland score, if not for Russell’s calmness and presence of mind under pressure. Earls was at it again late in the half, appearing in a similar position to usher a stray ball out of play with Scots lurking dangerously. If his defensive abilities were to the fore in the first half, he showed what a threat he could be in the second, charging forward and over the line to stretch Ireland’s advantage. The Irishman showed match-winning attributes at both ends of the pitch in an impressive display which overshadowed those in blue. There was a chance for Scotland to make a strong start to the Six Nations. A 33-20 triumph over Italy last weekend provided Gregor Townsend’s team with a rare opening win in the tournament and there was an opportunity to take advantage of an Ireland side smarting from their bruising defeat to England. With away games in France and England, if the Scots harboured any hope of challenging for the title they would need to win their home games. Of course, winning against Ireland and Wales was never going to be an easy task, but you can’t help but feel today’s disappointing - and arguably avoidable - defeat is the slow puncture which will ultimately flatten Scottish hopes.